The fracturing of the penciled and inked drawing mirrors in the colors of the subsequent panel, the lettering teetering this way and that to signify being on the edge… fantastic stuff. 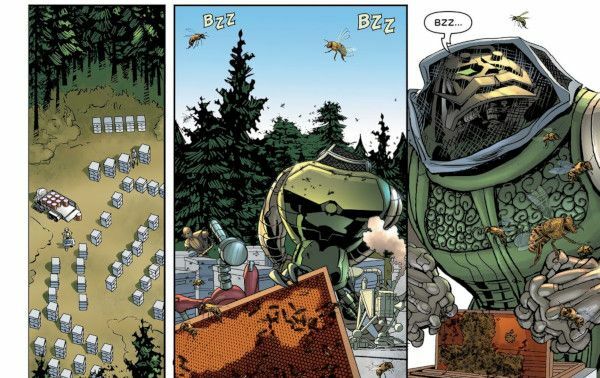 We don’t talk about coloring or lettering enough in comics, and we especially don’t talk about how each of those elements, from script on down, can reinforce each other when comics are at their finest. 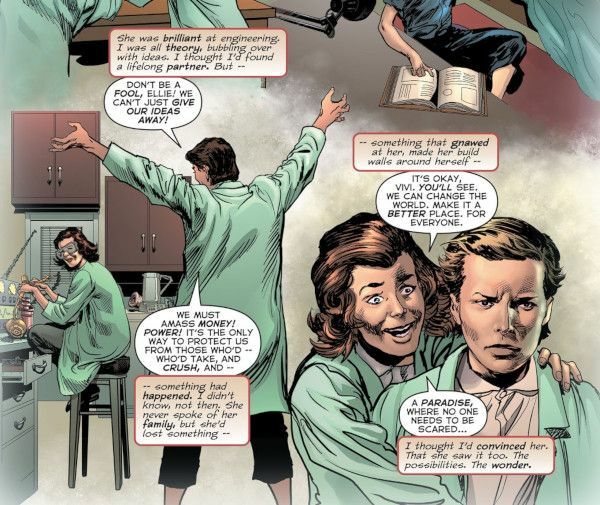 Comics, of course, has another famous rivalry that dates back to brilliant minds in college, with one of those present being someone with a V name. And once Ellie pieces it together – realizing that Vivi stole her brainwaves to make evil robots – she flies off in a giant Kirby-tech hover-chair, which was a very fun sentence to type. And once the culprit behind it all is revealed, it all clicks into place. Doctor Doom, of course, is famously motivated by a hatred of Reed Richards so obsessive, “RICHARDS! !” is its own meme by now. Vivi Viktor feels just as strongly about Ellie (and everything else, really.) 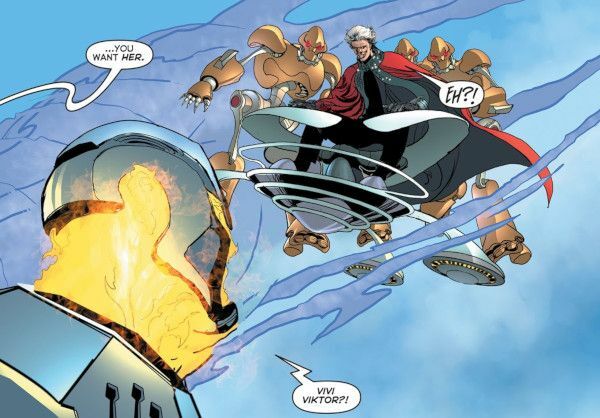 It’s weirdly interesting and cool to see a 70 year old female supervillain just be a supervillain, complete with a mad plan to take over the world and show them all, and a high tech hoverchair that looks like an unraveled top. 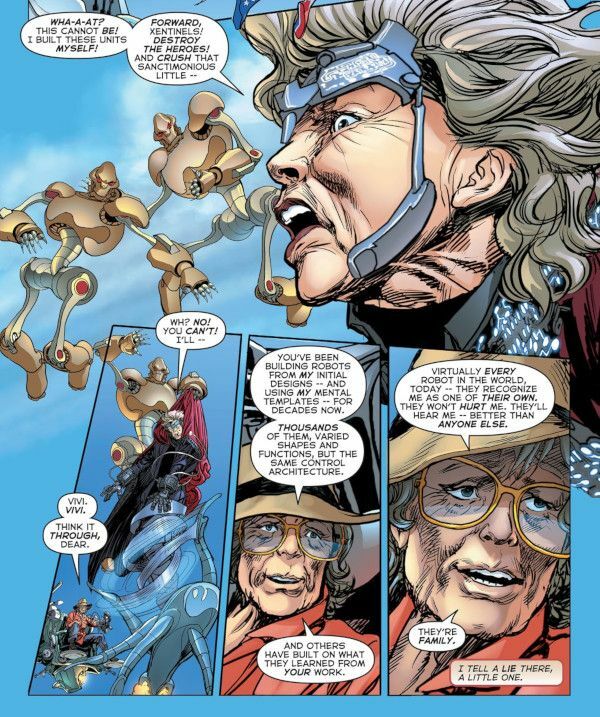 I love characters like the Junkman, but sometimes a 70 year old female supervillain who wants to rule the world is just a 70 year old female supervillain who wants to rule the world, and isn’t saying much about patriarchy against women in the last years of their lives. All this slams into, and is broken on, Ellie’s sunny well-shucks personality, and the fact that every robot under Vivi Viktor’s command refuses to attack Ellie. And so, it’s no coincidence that Ellie is old, and it’s no coincidence that this all started when her crummy nephew showed back up. The perils of growing old include loneliness and isolation, as your friends die and your family slowly grows into becoming their own people, and you go from being the center of their lives to merely a part of it. In such times, family – by blood, by marriage, found or manufactured – becomes more important than ever. Ellie’s robots have grown beyond being a hobby and into an extended family that spans the globe – albeit one that tends to get employed by super-villains – and in the end, her family can’t bring themselves to attack her, just as she can never bring herself to turn her back on her nephew, even if he is a bum. Like everything else in superhero comics, robots are a metaphor. In our world, robots look quite a bit different from walking, talking androids; they tend to be machines designed to assemble cars, computers that engage in a thousand stock trades a second, or algorithms that keep us engaged with social media regardless of whether or not it’s healthy. 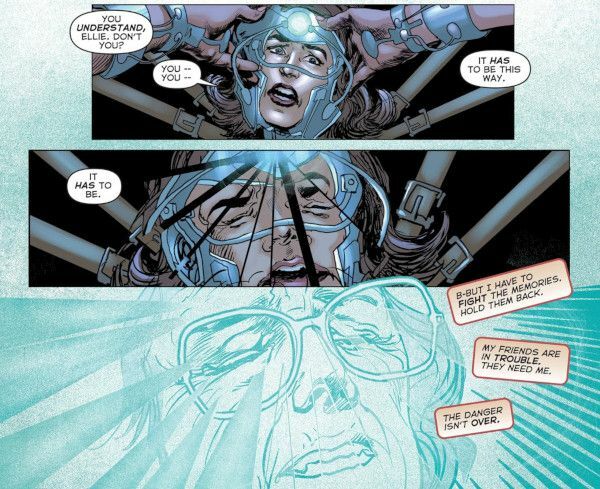 But robots in comics can represent anything from human fears of mechanization, to an exhaustively catalogued culture with its own political struggles, to fear of dehumanization, to – again, simply being something convenient for the hero to smash into a million pieces without dealing with the resulting hamburger. And sometimes even that last, simple metaphor can be expanded outwards into a metaphor for family – found family, but still family – that is complex and difficult and in the end, worth more than ever the older you get. 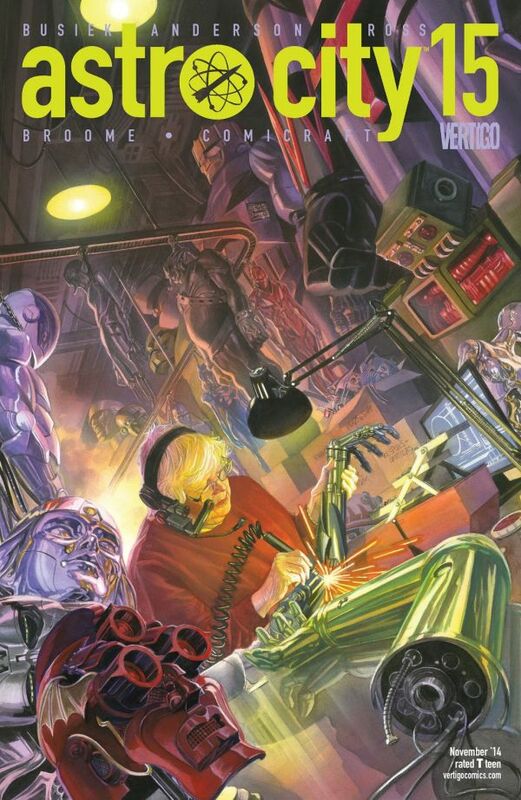 Next issue is my favorite Astro City story of all time, and one of the first comics I ever covered for critical purposes. We’ll see how I feel on the second go-over in a week’s time. See you then!